This card will be included in the Crazy Crafters Team Project Highlights this week - click here to see all the wonderful entries and vote for your favourites. Great excitement - my Holiday Catalogue pre-order arrived this morning. So instead of doing all the things I should have been doing, I've been using some of the lovely new products to make a 21st birthday card for my mother-in-law to give to my niece at the weekend. There are plenty of items in the new Holiday Catalogue that are versatile enough to be used for any occasion. There are also lots of great bundles in the catalogue - of which I took full advantage! It's a bit busy because I couldn't stop myself from adding more of the lovely goodies! I started by using one of the new stencils from the Seasonal Decorative Masks set (141848), sponged with Blushing Bride and Rich Razzleberry onto Whisper White cardstock to create a background pattern. 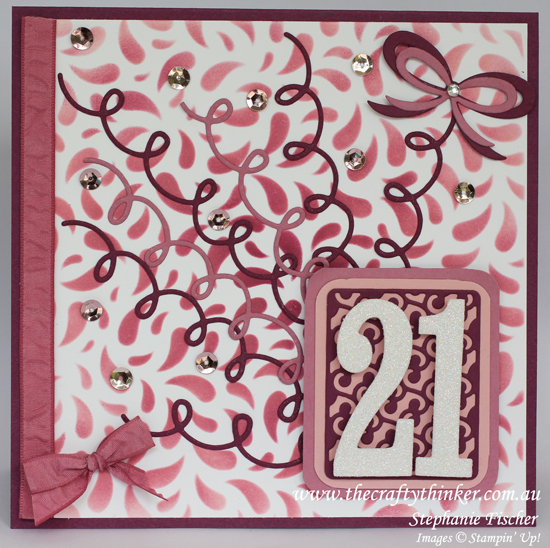 I used the Dazzling Diamonds Glimmer Paper for the numbers and cut some Rich Razzleberry cardstock using a die from the new Cheerful Tags Framelits. Then I layered all of the this onto pieces of Blushing Bride and Sweet Sugarplum cardstock (I used the Project Life Corner Punch to round the corners) before adding it to the card front with Dimensionals. The numbers are elevated by using the Foam Adhesive Strips. I added some Sweet Sugarplum Ruched Ribbon and then cut twirls out of Sweet Sugarplum and Rich Razzleberry cardstock using one of the dies from the Cupcake Cutouts Framelits. I attached these using the Fine-Tip Glue Pen along with some sequins from the gorgeous new mix called Fancy Frost (142519). The cute little bows at the top right of the card were cut from Sweet Sugarplum and Rich Razzleberry cardstock using the new Pretty Pines Thinlits die set (141851) . I decided to layer the two sizes to provide a bit more oomph. Interestingly, the little bow in the new Christmas Stockings Thinlits die set seems similar enough to also layer with the smaller of these bows. The greeting inside the card is from the stamp set included with the Watercolour Wishes kit. The products from the new Holiday Catalogue will be available for sale from 1st September 2016 to 3 January 2017. If you live in Australia, don't have (and are not yourself) a Stampin' Up! Distributor and would like a copy of the catalogue - contact me.